The Vortex 250 PDB supports the connection of an external microphone, via the ‘Mic’ port, CN9. A second connector, the Ext. Tx connector may also be used (see the FPV.co.uk cable below). The connector is a 3-pin Molex Picoblade, with compatible connector part number 051021-0300. Compatible pre-crimped cable assemblies may be purchased as Mouser Electronics, Molex part number 06-66-0013. 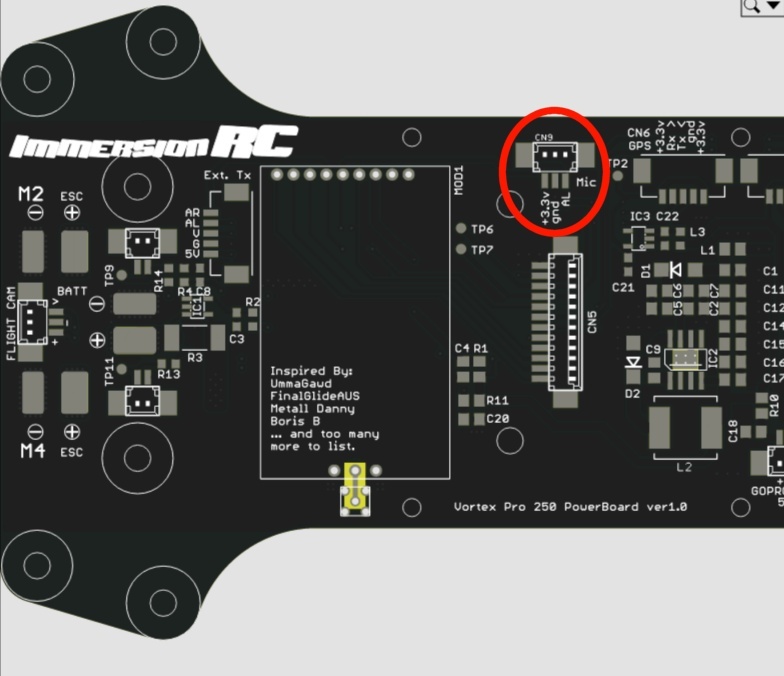 The three pins provide a +3.3V supply, and an input to the Audio Left-channel, follow the markings on the PCB for the pinout. Supplied without cables, three pre-crimped wires listed above are required. Note that this mic is pre-cabled for the Vortex family, using the alternative 5-pin vTx port.